The potential for Republicans to build on their already-gaudy collection of state governorships — they hold 31 of 50 — was rooted in their red state opportunities among the 15 states being contested this year and next year. Democrats are defending open seats in Kentucky this year, and Missouri and West Virginia next year. These are all states that Republicans now regularly win at the presidential level but where Democrats retain strength in elections for statewide executive offices. Democrats hold five of six of these executive offices in each of these three states. Still, one would think that Republicans should have a generic advantage in these states given the increasing nationalization of gubernatorial races and a natural desire for change following what will be at least eight straight years of Democratic control in each state. But there’s reason to question that generic GOP edge in all three states. In Tuesday’s Republican primary in Kentucky, businessman Matt Bevin apparently defeated Agriculture Commissioner James Comer and former Louisville Metro Councilman Hal Heiner. Bevin was the third wheel in the race for much of the contest as Comer and Heiner battled for first, but late-breaking accusations that Comer abused a former girlfriend upended the race, particularly because Comer alleged that Heiner played a role in bringing the accusations to light. The result cannot please the state GOP’s leader, Senate Majority Leader Mitch McConnell: Bevin challenged McConnell in a primary last year, which the long-time incumbent won handily. Bevin did not endorse McConnell in the general election. One would not expect McConnell to do much for Bevin, although it is worth remembering that Sen. Rand Paul got his start by defeating a McConnell ally in a 2010 Senate primary. McConnell and Paul are now uneasy allies, and McConnell has at least technically endorsed his fellow Bluegrass State senator for president, though we doubt McConnell’s support is all that deep. Bevin, assuming a recanvass and possible recount confirms his 83-vote win over Comer, moves on to face state Attorney General Jack Conway (D) in the general election. Conway lost to Paul in that 2010 Senate race. We have legitimate questions about the state party’s ability to come together after such a muddy primary, especially because the primary produced a candidate who just last year alienated vast swathes of the party leadership. Also, Democrats have shown mettle in Kentucky over the past few cycles: term-limited Gov. Steve Beshear (D) is popular and performed well in his two election victories, and Republican efforts to win the state House of Representatives last year stalled. The general election, we think, is anyone’s game. In fact, Conway probably starts out ahead, and Bevin will have to work hard to mend the fences he should have mended last year. 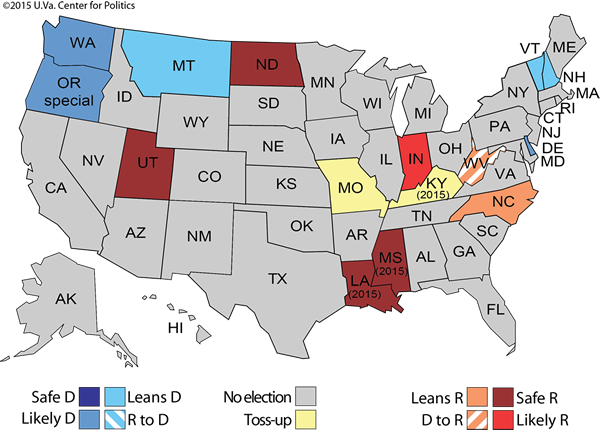 The Kentucky governors’ race is now a Toss-up, as opposed to Leans Republican. What happened in Kentucky reminds us of the unsettled field in next year’s Missouri GOP gubernatorial primary, although the events in the latter go far beyond the rough stuff and controversy of the Kentucky primary. State Auditor Tom Schweich (R) committed suicide earlier this year, and mean-spirited attacks from his political enemies appear to have contributed to the tragedy. As we wrote in April when we changed the rating from Leans Republican to Toss-up, the circumstances are unique and the primary and general election are hard to handicap. Announced or potential candidates include former state House Speaker Catherine Hanaway, 2012 Senate candidate/businessman John Brunner, former Navy SEAL Eric Greitens, and state Sen. Mike Parson, among others. State Attorney General Chris Koster, a former Republican, has a clear path to the Democratic nomination. In another 2016 red-state gubernatorial race — West Virginia — we still see a narrow Republican edge after Sen. Joe Manchin (D) passed on a run for his old job, but the candidacy of billionaire coal mine owner Jim Justice (D) is putting that rating to the test. Justice, who has never run for office but generated goodwill in the state by saving the Greenbrier resort, can effectively put unlimited amounts of money into the contest if he wants. However, Justice has a long and checkered business history for his opponents to dissect, and he does not have a clear primary field. State Senate Minority Leader Jeff Kessler is also running for the nomination, though he appears to be a substantial underdog. Republicans could have a primary of their own, with state Senate President Bill Cole, state Attorney General Patrick Morrisey, and U.S. Rep. David McKinley all considering the race. The two other gubernatorial elections this year, in the Deep South’s Louisiana and Mississippi, should both stay Republican, though there are developments for political watchers to monitor in both states. In Louisiana, an all-party primary in November will determine who advances to a runoff if no one clears 50%, which is likely. Sen. David Vitter (R) is the favorite, but there are two other credible Republican candidates, Lt. Gov. Jay Dardenne and Public Service Commissioner Scott Angelle, along with a single noteworthy Democrat, state Rep. John Bel Edwards. A recent poll from Southern Media and Opinion Research showed Vitter and Edwards advancing to the runoff. It may be that Dardenne and Angelle will need to train their fire not on Vitter, but on each other and Edwards, in order to set up a runoff with Vitter in December. Indeed, Louisiana State University Prof. Robert Mann, a former Democratic staffer and shrewd Bayou State political observer, just made a compelling argument about why state Democrats’ best bet to influence the gubernatorial outcome is to vote for a Republican other than Vitter. We agree with Mann: Edwards really doesn’t have a path to victory, so we’re moving the race from Likely Republican to Safe Republican. But maybe one of the other Republicans could make the runoff and get enough crossover support to threaten the front-running Vitter. On the other side of the Mississippi River, Gov. Phil Bryant (R) will have little trouble defeating attorney Vicki Slater (D) in his reelection bid, although there could be action down the ticket. Popular state Attorney General Jim Hood (D), the only statewide elected Democrat in the Deep South, is running for another term, and (while it is probably an illusion) Democrats believe they have an outside shot to win back the state House. Republicans currently control every state legislative chamber in the 11 states of the old Confederacy. The bottom line remains that Republicans are likelier to end 2016 with more governorships than they now control, but their path is bumpier than it seemed at the beginning of this cycle. 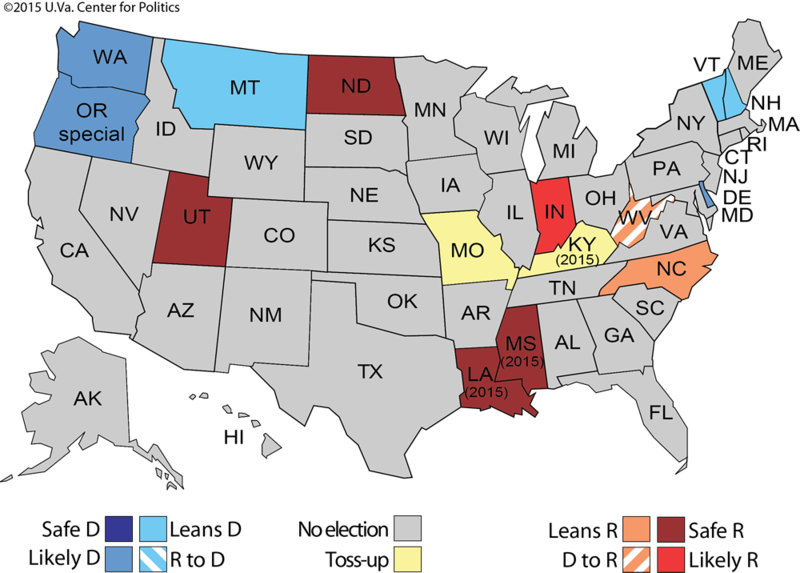 Map 1 shows our ratings of the 2015 and 2016 gubernatorial contests.